First, although the euro—the currency that Germany shares with 18 other countries—may (or may not) be at the right level for all 19 euro-zone countries as a group, it is too weak (given German wages and production costs) to be consistent with balanced German trade. In July 2014, the IMF estimated that Germany’s inflation-adjusted exchange rate was undervalued by 5-15 percent (see IMF, p. 20). Since then, the euro has fallen by an additional 20 percent relative to the dollar. 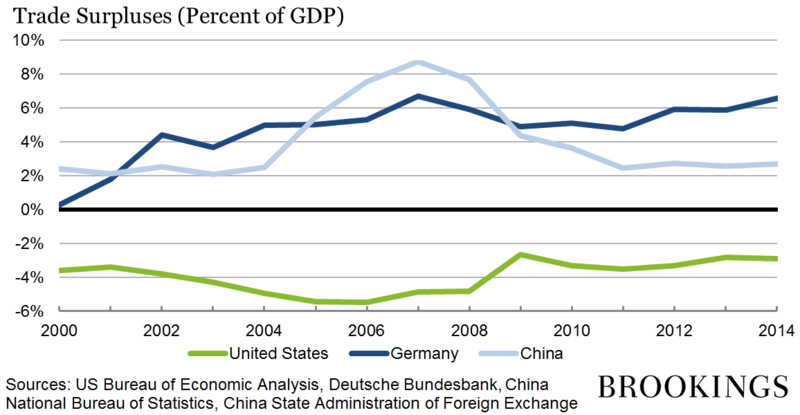 The comparatively weak euro is an underappreciated benefit to Germany of its participation in the currency union. If Germany were still using the deutschemark, presumably the DM would be much stronger than the euro is today, reducing the cost advantage of German exports substantially.